A horse tied to a hitching post. 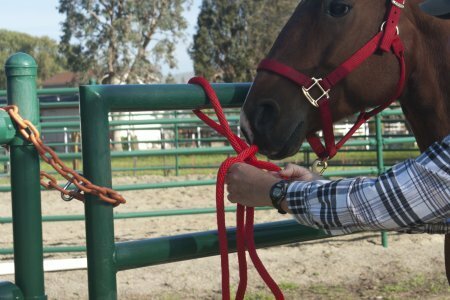 Securing a horse by tying is a basic skill for everyone that handles horses. 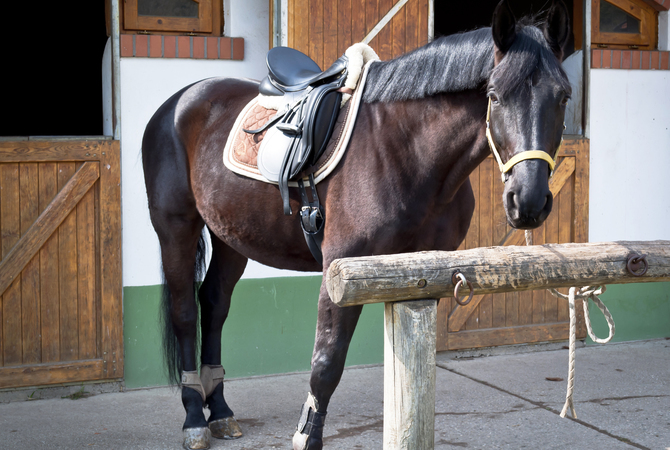 Surprisingly, many horse enthusiasts have not mastered this basic skill. 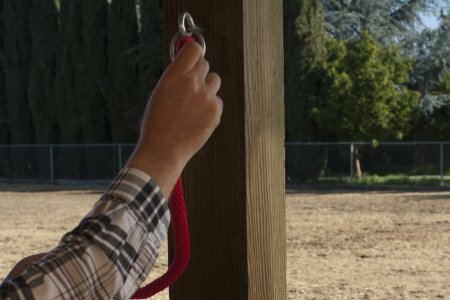 This slideshow illustrates a common technique for tying a horse, and also suggests potentially dangerous practices that should be avoided. The following sequence gives step by step illustrations for tying a slip knot. 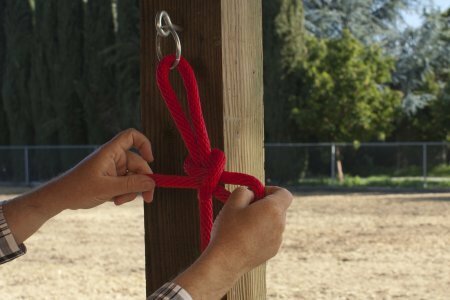 Use this knot to tie a horse to a tie ring secured to a tie post capable of restraining the horse. 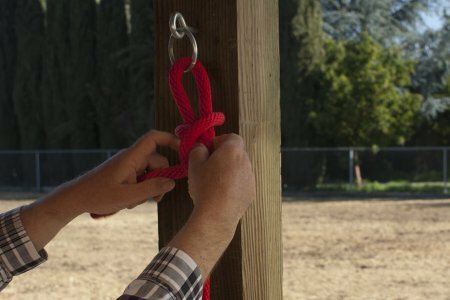 A slip knot is used as it is easy to untie when you need your horse. Many knots will tighten to the point that they are extremely difficult to untie - especially if there is an emergency situation. 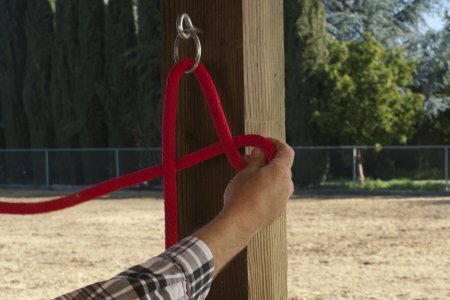 Start by threading the lead rope through the tie ring from front to back. Pull the tail of the rope through the ring. 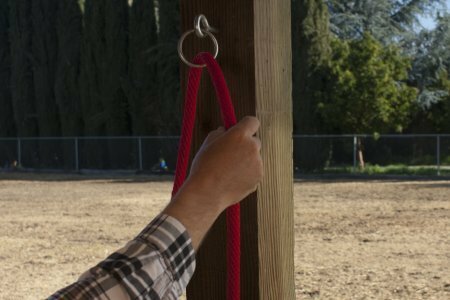 How much to pull through depends on the height of the ring, the length of the lead rope, and how tight or loose you wish to tie your horse. In general, an arms length of rope between the tie ring and the horse is adequate. Take the rope that was threaded through the ring and form a small loop by folding the rope underneath itself. 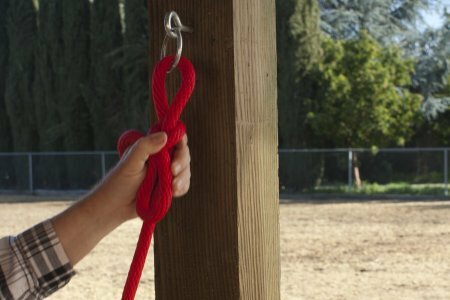 With your other hand, take a fold of the rope around the lead rope and push it through the small loop you made in Step 3. Now pull the folded loop through the smaller loop. Grasp the knot and push it up to the ring and pull the folded loop until the slipknot is tight. This is the finished knot. To untie it, simply pull the tail. The knot will pull loose. 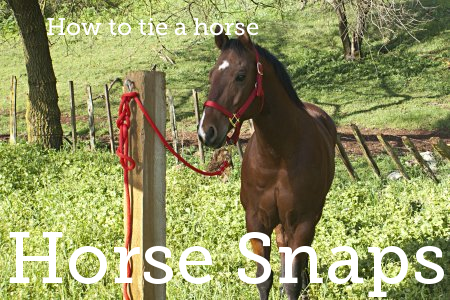 Some horses are capable of untying themselves when tied with a slip knot. Horses are normally mouthy, and left to their devices, will eventually pick up and pull the tail of the knot thus freeing themselves. 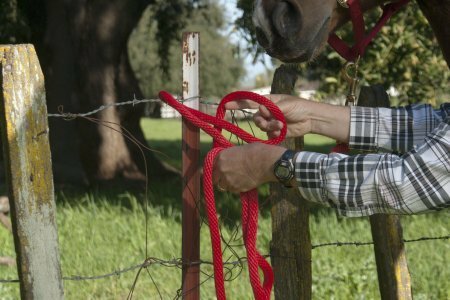 Many novice horse owners accidently tie their horse to a gate. If the horse pulls back, the gate can suddenly move toward the horse. This may frighten the horse and cause it to pull back to escape the approaching gate! A horse pulling back can easily uproot a bush or small tree. Always assume that your horse is going to spook and pull back occasionally. 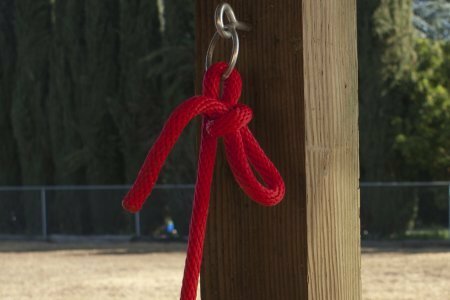 The tie point must be able to sustain a reasonable pull without MOVING or BREAKING. 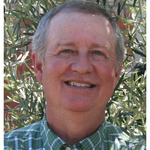 Injuries from contact with wire fences are well known to veterinarians. A wire fence is never a suitable location for tying your horse. 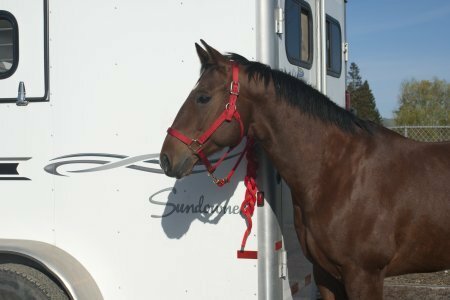 A horse may pull a reasonably large trailer if it is not attached to a tow vehicle. If more than one horse is tied to the trailer, additional danger is present. Only tie a horse to a trailer that is connected to the tow vehicle..